Industry has arrived in Bridgeton but the tenements still dominate. 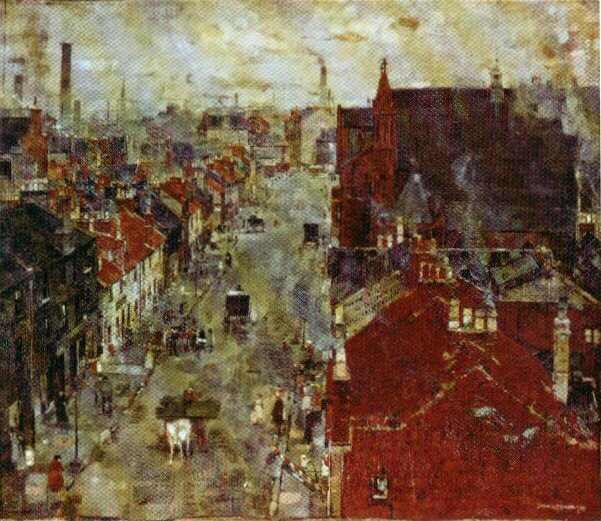 This painting was probably painted from a tenement window in Main St Bridgeton. 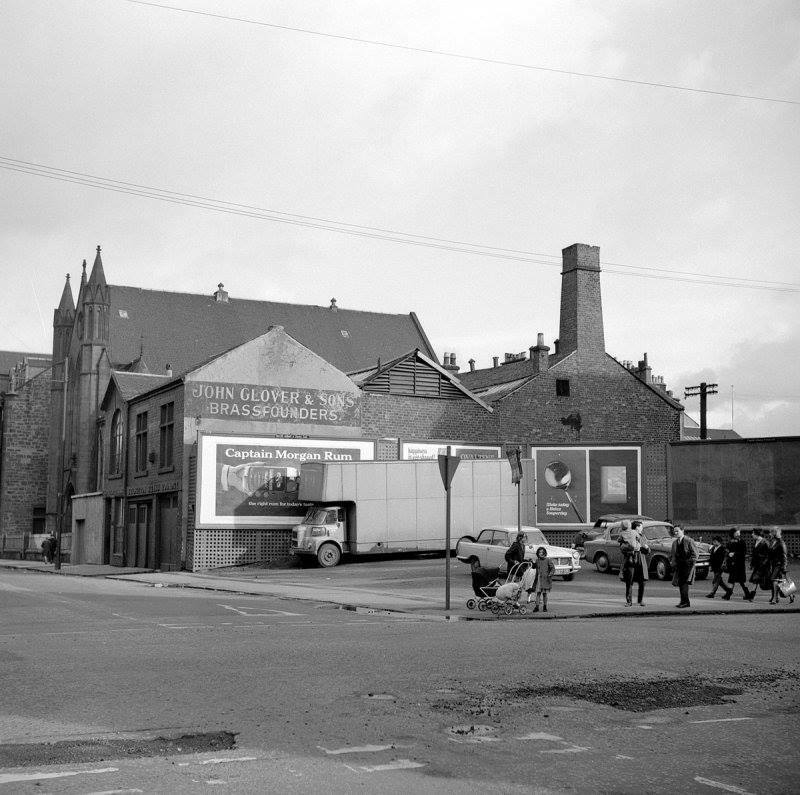 Muslin Street looking towards Dalmarnock Road. and named after Pastor Robert Hood. Hi Webmaister....most of my family were married in the Hood but ye really don't see the pictures of the church....more or less just the bridal party. One of my cousins was married there just after the war and my mother hated to wear a hat. Anyway...when my Mother and her sister arrived at the church one was wearing apple green and the other dusky pink and as usual everyone and their dog was waiting outside the church for the bride to arrive. When they got out the taxi apparently this big fat woman shouted "awe here comes the dolly sisters". It was all my Mother needed was that and the hat. Typical Brigton humour haha. By the way Webmaister...the Hood Memorial was well away long before 1969. That's why I was married in Newhall and Dalmarnock Parish Church. In fact my cousin was married a few years before me and she wasn't married in the Hood Memorial either. I don't believe it was away it may have been closed down as I remember it being there when I used to attend Langside College in 1970 / 1971 as I used to walk it home from College to the London Road in those days. 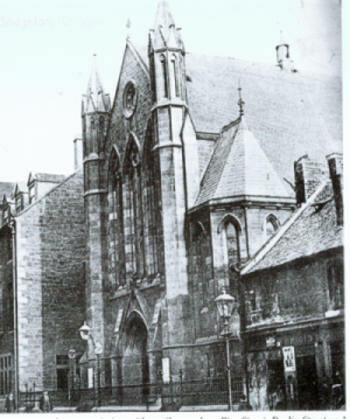 Are we talking about the church that was next to Bethany House in Muslin Street - it was still there in the early 1970's I can assure you of that but I don't know if it was used as a place of worship then. Did you know that Eric Liddell once preached a sermon in the Hood Memorial in the 1930's? The book on local churches said Wilma.......The congregations of the 3 local churches dwindled over the years until in 1969 it was decided that they should amalgamate. 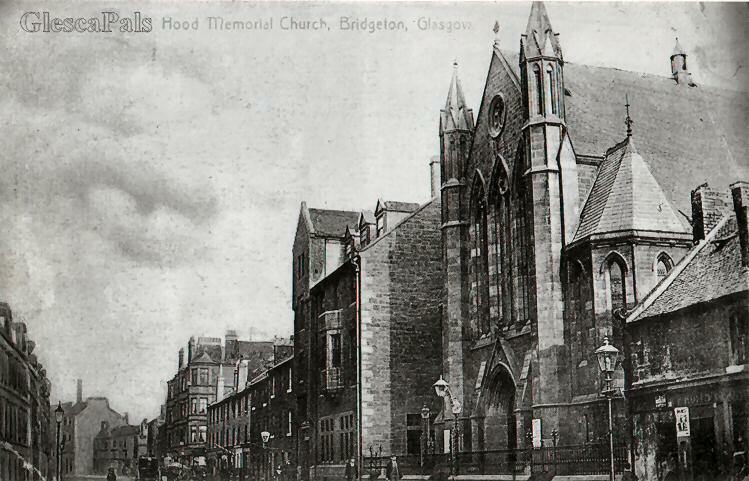 They then formed Bridgeton Congregational Church, using the Dalmarnock building. We had two of the girls who were medalist in either the Olympic or Commonwealth who came to one of the services at the church. I was only young at the time so can't remember too clearly. Two of my cousins went to the Boy Scouts there and were in the band. They had a pipe band and when we went to our Sunday School Picnic they led the parade to the station. We were all given streamers to wave and of course we all had wurr tinny wae a ribbon oan it aroon wur necks. That wis fur wurr cuppa milky tea we gote at the picnic wae wur box of sandwiches an co-op cakes.